This DVD release is probably the most eagerly expected release of recent years. In the mid- 1990s Augusto Schiavo and Caterinza Arzenton (former UK Open Professional Standard Champions) released their famous ABC of Ballroom, the visual version of the technique book on video tapes. The videos were an extremely successful production used by thousands of dancers in many countries. Unfortunatelly when the world converted from video tapes to DVDs, the ABC of Ballroom became obsolete. For a number of years there was no product on the market able to replace the ABC of Ballroom videos... until now! 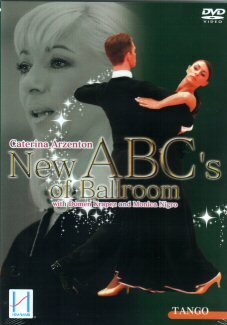 Now Caterina Arzenton is coming back with a new version of ABC's of Ballroom, this time on DVDs! The program covered by the New ABC's of Ballroom is very much the same as that covered by the former ABC of Ballroom, but this time Caterina Arzenton is the master mind explaining the technique and her students Domen Krapez and Monica Nigro (also internationally recognised Professional Ballroom stars) are demonstrating the figures. In our opinion a "must have" for any serious Ballroom dancer.